in the eastern-most part of the province of Venice. 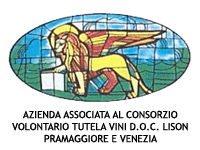 The "Lison-Pramaggiore" and "Venice" DOC region is located in the eastern-most part of the province of Venice. Its rich plains have been formed over the course of the millennia by glacial activity and floodwater deposits left by the retreat of melting glaciers. Because of these prehistoric floods and frequent shifting of its bed, the Tagliamento River has played a key role in the soil formation of the area. Thanks to the shifts in slope and displacement, the minute particles of calcareous clay typical of most grape-growing areas were deposited here. In the soil, not far from the surface, can also be found the layers of carbonate aggregate that give rise to its local fame as "caranto-rich land". Just further confirmation of what has been known for centuries, that limestone-based soil produces quality wines rich in aromatic substances. 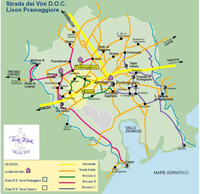 It was this confluence of factors that persuaded Dino Musaragno to select these lands on which to found his vineyard, knowing they would yield the best grapes.